AWS Documentation » Amazon VPC » User Guide » What Is Amazon VPC? Amazon Virtual Private Cloud (Amazon VPC) enables you to launch AWS resources into a virtual network that you've defined. This virtual network closely resembles a traditional network that you'd operate in your own data center, with the benefits of using the scalable infrastructure of AWS. Amazon VPC is the networking layer for Amazon EC2. If you're new to Amazon EC2, see What is Amazon EC2? in the Amazon EC2 User Guide for Linux Instances to get a brief overview. A virtual private cloud (VPC) is a virtual network dedicated to your AWS account. It is logically isolated from other virtual networks in the AWS Cloud. You can launch your AWS resources, such as Amazon EC2 instances, into your VPC. 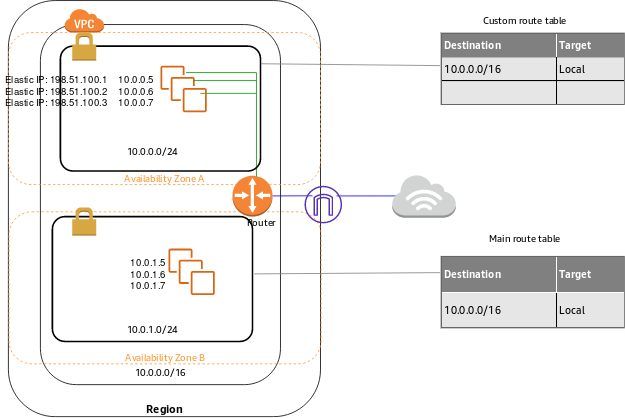 You can specify an IP address range for the VPC, add subnets, associate security groups, and configure route tables. A subnet is a range of IP addresses in your VPC. You can launch AWS resources into a specified subnet. Use a public subnet for resources that must be connected to the internet, and a private subnet for resources that won't be connected to the internet. For more information about public and private subnets, see VPC and Subnet Basics. To protect the AWS resources in each subnet, you can use multiple layers of security, including security groups and network access control lists (ACL). For more information, see Security. The original release of Amazon EC2 supported a single, flat network that's shared with other customers called the EC2-Classic platform. Earlier AWS accounts still support this platform, and can launch instances into either EC2-Classic or a VPC. Accounts created after 2013-12-04 support EC2-VPC only. For more information, see Detecting Your Supported Platforms and Whether You Have a Default VPC. If your account supports the EC2-VPC platform only, it comes with a default VPC that has a default subnet in each Availability Zone. A default VPC has the benefits of the advanced features provided by EC2-VPC, and is ready for you to use. If you have a default VPC and don't specify a subnet when you launch an instance, the instance is launched into your default VPC. You can launch instances into your default VPC without needing to know anything about Amazon VPC. Your default VPC includes an internet gateway, and each default subnet is a public subnet. Each instance that you launch into a default subnet has a private IPv4 address and a public IPv4 address. These instances can communicate with the internet through the internet gateway. An internet gateway enables your instances to connect to the internet through the Amazon EC2 network edge. By default, each instance that you launch into a nondefault subnet has a private IPv4 address, but no public IPv4 address, unless you specifically assign one at launch, or you modify the subnet's public IP address attribute. These instances can communicate with each other, but can't access the internet. Alternatively, to allow an instance in your VPC to initiate outbound connections to the internet but prevent unsolicited inbound connections from the internet, you can use a network address translation (NAT) device for IPv4 traffic. NAT maps multiple private IPv4 addresses to a single public IPv4 address. A NAT device has an Elastic IP address and is connected to the internet through an internet gateway. You can connect an instance in a private subnet to the internet through the NAT device, which routes traffic from the instance to the internet gateway, and routes any responses to the instance. For more information, see NAT. You can optionally associate an Amazon-provided IPv6 CIDR block with your VPC and assign IPv6 addresses to your instances. Instances can connect to the internet over IPv6 through an internet gateway. Alternatively, instances can initiate outbound connections to the internet over IPv6 using an egress-only internet gateway. For more information, see Egress-Only Internet Gateways. IPv6 traffic is separate from IPv4 traffic; your route tables must include separate routes for IPv6 traffic. 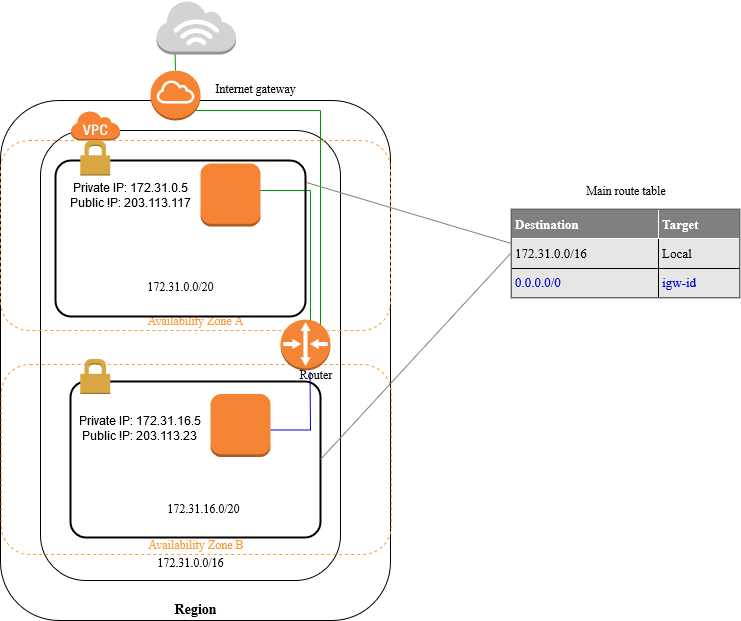 You can optionally connect your VPC to your own corporate data center using an IPsec AWS Site-to-Site VPN connection, making the AWS Cloud an extension of your data center. A Site-to-Site VPN connection consists of a virtual private gateway attached to your VPC and a customer gateway located in your data center. A virtual private gateway is the VPN concentrator on the Amazon side of the Site-to-Site VPN connection. A customer gateway is a physical device or software appliance on your side of the Site-to-Site VPN connection. For more information, see What is AWS Site-to-Site VPN? in the AWS Site-to-Site VPN User Guide. AWS PrivateLink is a highly available, scalable technology that enables you to privately connect your VPC to supported AWS services, services hosted by other AWS accounts (VPC endpoint services), and supported AWS Marketplace partner services. You do not require an internet gateway, NAT device, public IP address, AWS Direct Connect connection, or AWS Site-to-Site VPN connection to communicate with the service. Traffic between your VPC and the service does not leave the Amazon network. To use AWS PrivateLink, create an interface VPC endpoint for a service in your VPC. This creates an elastic network interface in your subnet with a private IP address that serves as an entry point for traffic destined to the service. For more information, see VPC Endpoints. You can create your own AWS PrivateLink-powered service (endpoint service) and enable other AWS customers to access your service. For more information, see VPC Endpoint Services (AWS PrivateLink). AWS provides a high-performance, and low-latency private global network that delivers a secure cloud computing environment to support your networking needs. AWS Regions are connected to multiple Internet Service Providers (ISPs) as well as to a private global network backbone, which provides improved network performance for cross-Region traffic sent by customers. 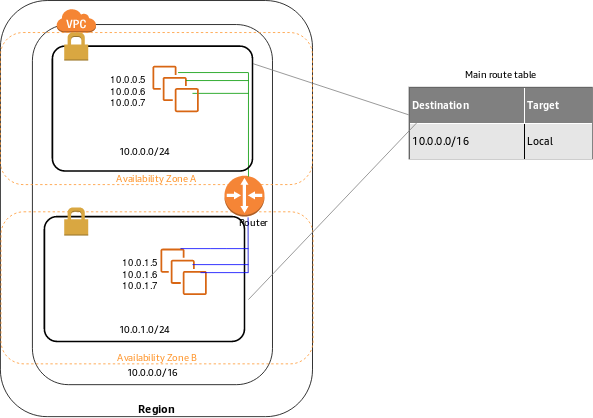 Traffic that is in an Availability Zone, or between Availability Zones in all Regions, routes over the AWS private global network. Traffic that is between Regions always routes over the AWS private global network, except for China Regions. To get a hands-on introduction to Amazon VPC, complete Getting Started with Amazon VPC. This exercise guides you through the steps to create a nondefault VPC with a public subnet, and to launch an instance into your subnet. To learn about the basic scenarios for Amazon VPC, see Scenarios and Examples. You can configure your VPC and subnets in other ways to suit your needs. Provides an overview of the options for network connectivity. Information to help you get started building on AWS. Amazon VPC provides a web-based user interface, the Amazon VPC console. If you've signed up for an AWS account, you can access the Amazon VPC console by signing into the AWS Management Console and choosing VPC. Provides commands for a broad set of AWS services, and is supported on Windows, macOS, and Linux/Unix. To get started, see AWS Command Line Interface User Guide. For more information about the commands for Amazon VPC, see ec2. Provides commands for a broad set of AWS services for those who script in the PowerShell environment. To get started, see AWS Tools for Windows PowerShell User Guide. Amazon VPC provides a Query API. These requests are HTTP or HTTPS requests that use the HTTP verbs GET or POST and a Query parameter named Action. For more information, see Actions in the Amazon EC2 API Reference. To build applications using language-specific APIs instead of submitting a request over HTTP or HTTPS, AWS provides libraries, sample code, tutorials, and other resources for software developers. These libraries provide basic functions that automatically take care of tasks such as cryptographically signing your requests, retrying requests, and handling error responses. For more information, see AWS SDKs and Tools. There's no additional charge for using Amazon VPC. You pay the standard rates for the instances and other Amazon EC2 features that you use. There are charges for using an Site-to-Site VPN connection and using a NAT gateway. For more information, see Amazon VPC Pricing and Amazon EC2 Pricing. There are limits to the number of Amazon VPC components that you can provision. You can request an increase for some of these limits. For more information, see Amazon VPC Limits. Amazon VPC supports the processing, storage, and transmission of credit card data by a merchant or service provider, and has been validated as being compliant with Payment Card Industry (PCI) Data Security Standard (DSS). For more information about PCI DSS, including how to request a copy of the AWS PCI Compliance Package, see PCI DSS Level 1.